Some people love to craft things out of objects that seem trash already. Most of the products are functional as that of the new ones. If you, yourself, have the ability to craft things, restore damaged or undamaged body parts of a motorcycle and the like, then this course suits your talent. Not only will it enhance your craftsmanship, you may learn a thing or two about the interpretation of manuals as well as application of specifications. TESDA offers you Automotive Body Painting/Finishing NC II. It is one of the newest short courses offered in the Philippines that trains you in repairing body or panel paint on land based vehicles such as automobiles, trucks, buses, big bikes and motorcycles. You may also learn how to revamp those vehicles by covering colorful paints; put on and take away masks, and implement maintenance. Let your talent be of use as we recommend this short program to people like you. Visit your nearest TESDA institution and check this out, right away. The hours allotted for Automotive Body Painting/Finishing NC II takes a minimum of 158 hours to accomplish. In other Technical Vocational Institutions, they require people to finish Automotive Body Painting/Finishing NC I first before being endorsed to take Automotive Body Painting/Finishing NC II. 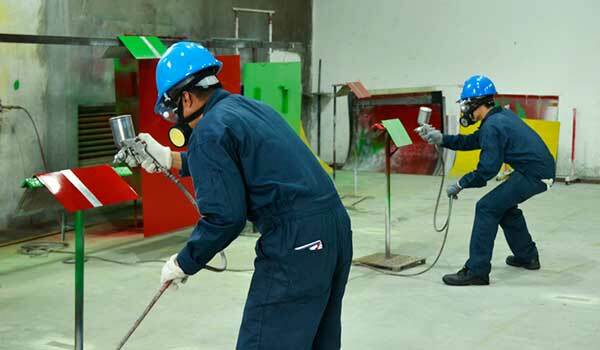 Those who are qualified graduates of Automotive Body Painting/Finishing NC II may find employment as an automotive painter for two stage paint or as an automotive paint finisher for two stage paint. Those who are enrolled in the Automotive Body Painting/Finishing NC II may be required to undergo a Competency Assessment before graduation. This is applicable to any of the courses you would enroll at. A National Certificate will be issued to those who will pass this assessment. For accurate and more detailed information about the Assessment and Certification, you may visit the this link. Ask ko lang po kong pweding mag enroll sa tesda yong under graduate ng high school? Add ko lang po' wala po bang age limit, yong 62 years old po pwede pa mag take ng vocational course like aircon servicing? saang tesda branch po o accredited training center merong offered na auto body painting?